Came for an early dinner with my mom, sister & niece. My first time there, but they all have been before. I like the wood decor. The staff were friendly and pretty attentive. We went with the Combo for 2 - Plenty of banchans and most were tasty. The meats seemed to be good quality. That onion mixture was good, never got something like that at other Korean BBQ places. BimBiBop - I thought this was okay. I did like the crunchy part of the rice. We also got regular rice and I thought that went with the BBQ items better. Fire Chicken - Surprisingly, not that spicy. I liked it, but a bit weird that there was purple cabbage in it. I could do without that. Also, a tad oily. Overall, I liked it. Would come back since it's closer than heading up north. It's not really cheap, so a place to go once in a long while. "Who goes to Chinatown to eat Korean food?" is what we've been saying quite some time and have even avoiding this place. But the truth was, we've had Chinatown Chinese food frequently recently and we were ready for something different when we were nearby. Daebak was brought to our attention, and so here we go. We did it. And I'm not ashamed at all! Thanks to Yelp Waitlist, it was so easy and convenient to get a table. At the time I signed up, the wait time was 15 minutes. When I arrived, I had to wait another about 5 minutes; decided to walk around the Square. Then I got a text message that my table is ready so we started to head back. Decided to get pork combo. You can pick either C1, C2, and one choice from: C3, C4, or C5. I liked the corn & egg concept from BBQ restaurants in LA and was so excited when it came to Chicago! The meat and the corn & eggs were good. But beware-- banchan are not good. They were rather disappointing. The fish cake was undercooked, and others were flavorless. Kimchi was the best banchan dish, sad to say. I love that they give you korean style pot of water- you can easily refill it without having to ask servers constantly. Our service was good, up until the point when our meat was all cooked. The servers help you cook the meat. When they finished final batch of cooking, servers were nowhere to be found to 1- refill our water pot, 2- get to go boxes, and 3- take the check. We finally flagged down our busboy after 5-10 minutes of waiting because literally, not one server came near us. 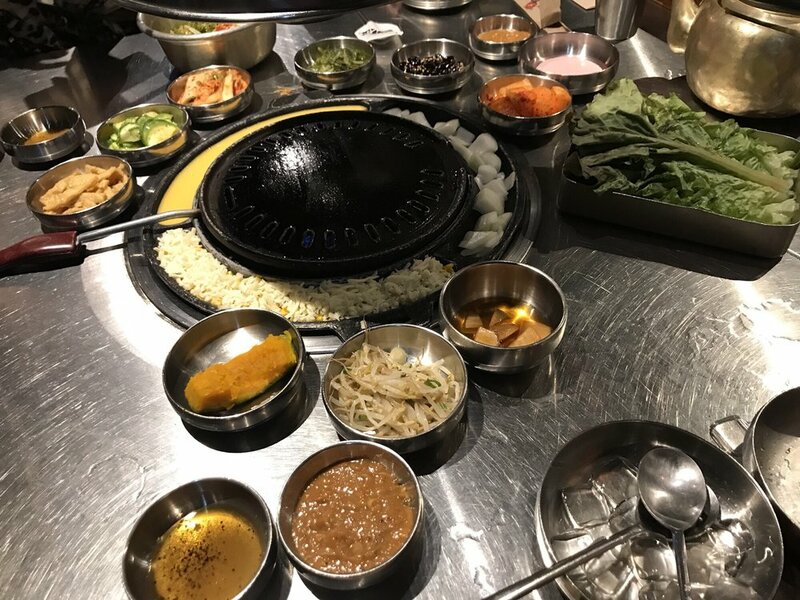 One of a better thing is that they have vent system directly above the grill so you clothes and body don't smell go much like Korean BBQ. Would I go back? Maybe. Would I go back more frequently if it weren't in Chinatown? Probably. If I'm driving all the way to Chinatown, then I'm gonna have Chinese food- sorry to say. The Spicy Chicken Cheese Rice dish is my absolute favorite! Went with a group and you'll get an automatic gratuity added for a party of 6 or more. We also got different combos of meat which some were a bit blander. Besides that, overall, everything is tasty and flavorful and a great experience to share with a group of friends. If Daebak continues to keep this up, Daebak is here to stay. Wonderful service too! **Be prepared to open your wallet. Excellent spot for Korean food. This is my second time at this place and it never disappoints! It's located right in china town, you walk up stairs to get to the actual restaurant and then when you hear the K-pop, you'll know you're there! The thick and crispy seafood pancake is a must. 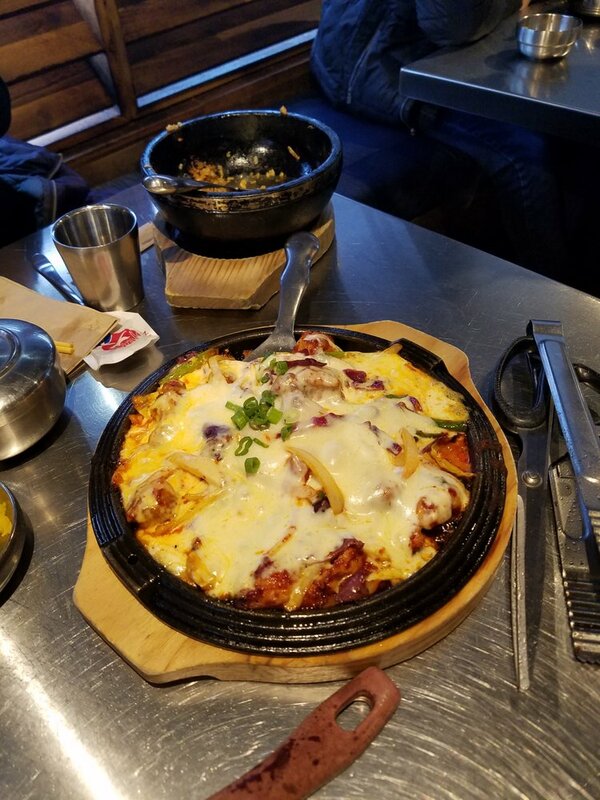 It's a very hearty appetizer and If there's only 2 of you, plan on a lighter main or you'll be taking most of it home with you. It comes with an unbelievably delicious sauce. For main, we went for the stone bowl beef bibimbap. Remember to start mixing it as soon as your server puts it down because that rice starts to caramelize almost immediately (that's the best part though!) It has all kinds of veggies, the beef and then an egg to top it all off. By far my favorite dish at any Korean restaurant and this one was up there with the best. You can't go wrong with it! This site is in no way affiliated with or endorsed by Daebak Korean BBQ. It exists as a compendium of supporting information intended for informational purposes only.